To keep you active through the day, a nourishing breakfast is essential. 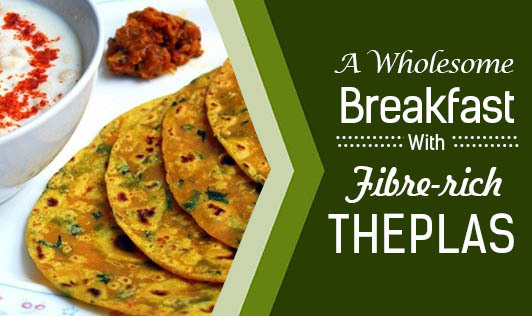 Here is a fibre-rich breakfast recipe of fibre rich that is suitable for all age groups. 1. Heat the oil in a pan, add the onions and sauté on a medium flame for 2 minutes. 2. Add the capsicum and sauté on a medium flame for another 2 to 3 minutes. 3. Add the paneer, coriander and salt, mix well and cook for another 1 to 2 minutes, while stirring continuously. 4. Remove from the flame and allow it to cool completely. 5. Divide the stuffing into 10 equal portions and keep aside. 1. Combine all the ingredients in a bowl and knead into soft dough using enough water. 2. Divide the dough into 10 equal portions and roll out a portion into a 4" diameter thick circle, using a little jowar flour for rolling. 3. Cook them on a non-stick tava (griddle) using a little oil, till it turns golden brown in colour from both the sides. 4. Repeat with the remaining portions to make 9 more mini theplas. 5. Spread a portion of the topping evenly over each mini thepla and serve immediately.